This is a story about the the White Shaman mural, a pre-historic wall painting, that was discovered by Carolyn Boyd in Comstock, Texas, awhile back in 1992. Today, Dr. Mario Garza and Gary Perez of the Indigenous Cultures Institute in San Marcos, Texas, continue forward with this work, conducting research and delivering lectures on our ancient ancestors. All so fascinating. The figures at the White Shaman rock shelter seem to depict a journey through the spirit world. Carolyn Boyd guides her pickup down a cliffside trail overlooking Dead Mans Pass, a limestone canyon cut deep into the back country of southwest Texas. A ring of black vultures circles overhead. Boyd slows the truck and scans the canyon for what has drawn their interest. On top of a boulder, splayed out like a ritual sacrifice, is a half-eaten goat carcass. “Mountain lion,” she says. The region known as the Lower Pecos is an arid 21,000-square-mile expanse of southwest Texas and northern Mexico surrounding the confluence of the Pecos River and the Rio Grande. The land is barbed with cacti, teeming with rattlesnakes, and riven with impassable canyons. But more than 4,000 years ago, these barrens were home to a flourishing culture of hunter-gatherers, creators of some of the world’s most complex and beautiful prehistoric rock art. The literal meaning of those paintings had been dismissed as an unsolvable mystery—until recently. Boyd began sketching the paintings, studying them carefully. Archaeologists believed that the images at White Shaman were essentially unrelated, each depicting an individual ritual, and at first glance, the mural did seem chaotic: Swarms of indecipherable markings surrounded figures painted one on top of the other. Boyd hunted for clues. One came from Ralph Beals, a UCLA anthropologist who studied the Yaqui, a tribe in northwestern Mexico and southern Arizona. In Beals’s work, a Yaqui shaman said that when he journeyed to the underworld, he “passed through the body of a snake.” This was a pattern: Nearly every tribe in the region envisioned a serpent as the divider between the earthly and the spiritual realms, explaining the wavy lines on the Lower Pecos rocks. The same kinds of stories explained the animal adornments; when shamans traveled to the underworld, each had a “spirit animal” for protector and guide. One morning later that spring, Boyd rolled up her pants and waded across the Devils River to Cedar Springs, a horseshoe-shaped site a few miles north of Mystic Shelter (see photo above). Cedar Springs had a cascade of human figures holding spear-throwers and long staffs adorned with feathers. As Boyd scrutinized the paintings, three images, one beside the other, caught her eye. First was a human figure with antlers tipped with peculiar black dots. Nearby was a cluster of fringed black dots with spears sticking out of them. Alongside those were tiny deer figures, also impaled with spears. Her mind raced—she had seen the same group of images at White Shaman. Again Boyd dove into the ethnographic texts. This time her first clue came from a photograph of a yarn painting by a modern Huichol artist. It depicted a deer with dots on its body and attached to its antlers, just like the curious black-tipped antlers she had seen in the rock art. The Huichol people are almost unique in the Americas. Protected by the fortresslike Sierra Madre mountains, the group had escaped notice by Europeans when they arrived in the 16th century. Huichol culture remained virtually unchanged, providing a rare 21st-century window into pre-Columbian times. In the literature, Boyd read of a peculiar Huichol pilgrimage during the rainy season to Wirikuta, a desert plateau they considered their sacred homeland in the northeast. There they collected peyote, a hallucinogenic cactus that helps them contact ancestral spirits in the otherworld. Boyd was intrigued by the way the Huichol gathered peyote. They stayed low and moved across the plateau holding bows and arrows. It was the same way they hunted deer. To the Huichol, deer and peyote were a single sacred symbol. When one of the pilgrims found a peyote cactus peeking above­ground in the desert, he pulled his bowstring taut and shot an arrow through its center. He was “slaying” the peyote, but he was also slaying a deer. Boyd recalled the speared dots and deer in the ancient paintings. She wondered: Could she find a connection to peyote there as well? In an old excavation report Boyd read that archaeologists had discovered remnants of peyote cacti from a site near White Shaman. The peyote, which had been flattened into button shapes and mixed with other plant materials, dated to about a thousand years before the paintings. The molded buttons were proof that the ancient inhabitants of the Lower Pecos had used peyote in rituals. Boyd herself takes great care to qualify her theory. She says it wasn’t actually the Huichol who made the 4,000-year-old paintings—it was their distant ancestors or relations. The Huichol rituals appear so prominently only because their culture is the best preserved in the region. But the Huichol are just one tribe among many with mythology linked to the paintings in the canyons of the Lower Pecos. Boyd has found similar connections in the mythology of the Hopi, the Zapotec, and other tribes throughout Mexico and the American Southwest. The rock art, Boyd says, displays an archaic core: an ancient belief system that has been widely shared in Mesoamerican mythological traditions. In July 2010 Boyd invited a Huichol shaman from the Sierra Madre to White Shaman. In his sixties, bright-eyed with a square jaw, the shaman wore traditional dress: a wide-brimmed hat, a brightly colored woven shoulder bag, flowing white pants, and a shirt embroidered with small deer figures and colorful peyote symbols. For some minutes he studied the mural. He pointed to the watery, black-and-red underworld in the West, to the antler-headed human, to the humans marching across the rock face, then to the deities rising above each of the humans. Will Hunt is a writer in New York. The book is produced by Momentum Instruction, a company that appears to be owned or operated by Cynthia Dunbar, a member of the Texas State Board of Education from 2007 to 2011. Dunbar, a right-wing Christian activist who questioned the constitutionality of public schools in 2008, labeled the education system “tyrannical” when she published her book, One Nation Under God, while serving on the board. Sigh. The Texas SBOE never ceases to amaze. Dunbar is an anti-public school zealot who had earlier described public education as a "tool of Satan." You can't make this stuff up! According to Roque Planas in a Huffington Post article on the same topic, indicates that Dunbar now works at Jerry Falwell’s Liberty University as an administrator. He correctly asks by what magic is she now a multiculturalist? And what makes authors Jaime Riddle and Valarie Angle Texas historians may be similarly asked. Texas boasts a large number of renowned Mexican American Texas historians like Emilio Zamora, Andres Tijerina, Frank de la Teja, Antonia Castañeda, Carlos Blanton, Miguel Levario, and others such that the Texas Education Agency need not accord Dunbar's textbook any regard when there's serious scholars that are already doing this work. Heck, their bias is even evident on their book's front cover. As many beautiful images as there are of Mexica (or Aztec) danzantes, they could have done much better. The guy looks menacing, especially when considered in the context of this text that says that Mexican Americans—or more specifically, Chicanos—are people that “adopted a revolutionary narrative that opposed Western civilization and wanted to destroy this society.” This statement alone shows that they can't even make it to first base with this text. It's a subliminal warning to Anglos like Donald Trump whose politics incite irrational fears of a browning America, of an alleged reconquista. If you happen to think the cover is beautiful, no problem—as it is inescapably gratuitous regardless. A textbook proposed to help teach the cultural history of Mexican-Americans in Texas public schools is under scrutiny by scholars, some of whom decry the effort as racist and not a reflection of serious academic study. The State Board of Education voted to include textbooks on Mexican-American studies after activists last year demanded the subject be formally included in state curriculum. 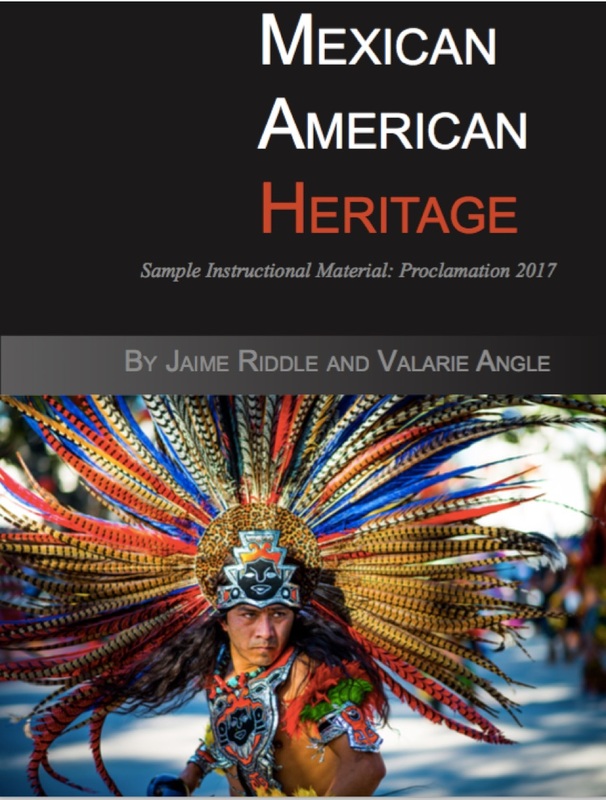 Mexican American Heritage is the first textbook on the subject included in a list of proposed instructional materials. The Texas Education Agency says it followed standard procedure for the call to submit instructional materials for Mexican-American curriculums for the 2017-18 school year. Texans have until September to submit comments on the proposed instructional materials, TEA spokeswoman DeEtta Culbertson said. She also said the proposed textbooks will undergo review by a committee that includes teachers and administrators and that committee will make recommendations to the board. Ultimately, books adopted by the elected members of the Texas State Board of Education in November become part of the recommended instructional materials for statewide curriculums, but school districts aren’t required to embrace them. Individual districts can use their state money to buy whatever textbooks they wish. Neither Dunbar nor any of the book’s other authors could be reached for comment. A phone message and email to Momentum Instruction were not returned. The Texas Board of Education’s members sanction textbooks for use statewide in a process that has for years been marred by ideological fights over lessons on subjects including evolution, climate change and the influence of biblical figures such as Moses on America’s Founding Fathers. 801 East Cesar E. Chavez Blvd. San Antonio will host the Texas Summit on Implementing Mexican American Studies in Texas Schools. The summit is organized by the National Association for Chicana & Chicano Studies (NACCS) regional conference, Tejas Foco Committee on Mexican American Studies (MAS) in Pre-K –12. The one-day event will be held on Saturday, June 18, 2016, at San Antonio College. The summit is free and open to all educators and community members who are interested in participating in creating a strategic plan for implementing Mexican American Studies in Texas schools. 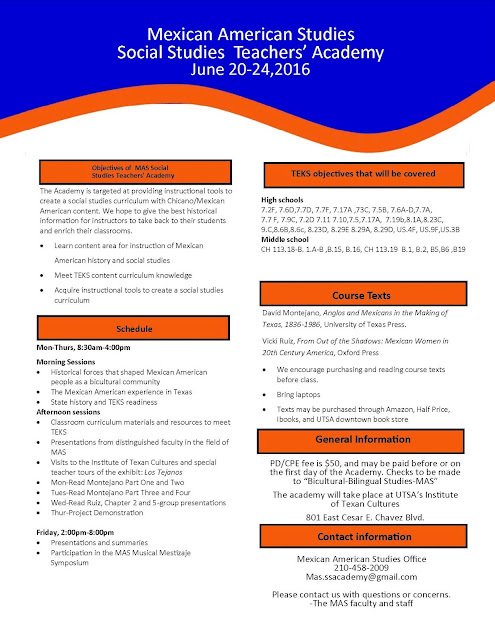 The goals of the Texas Summit on Implementing MAS in Public Schools are to identify institutional barriers, establish priorities, and develop a plan of action for the implementation of Mexican American Studies in Texas schools from Pre-K to 12th grade and for increasing access to MAS courses and content within the broader community. 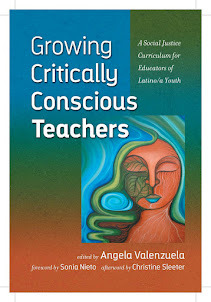 Teachers and experts in the field of Mexican American Studies will facilitate workshops and breakout sessions on various topics, including: Information & Data Collection, Media/Promotions, Political/Legislative, Community-Based MAS Programs, and developing curriculum, textbooks, teacher training, and other in-school programs for Elementary/Pre-K-5th grade, Middle and High Schools. The Texas Summit on Implementing MAS in Texas Schools is hosted by San Antonio College & co-sponsored by the Palo Alto College Center for Mexican American Studies, the Center for Mexican American Studies at UT-San Antonio, Somos MAS/Mexican American Studies San Antonio, Tejas, the Center for Mexican American Studies and Research at Our Lady of the Lake University, MAS Unidxs, the Mexican American Studies Program at UT Rio Grande Valley, the Rio Grande Valley Coalition for Mexican American Studies in K-12 Education, and MAS for the Masses. Register for free tickets at https://www.eventbrite.com/e/texas-summit-on-implementing-mexican-american-studies-in-pre-k-12-education-tickets-25123950412. For more information contact Dr. Christopher Carmona at 956.854.1717 or christopher.carmona@utrgv.edu. Re-posting this from Valerie Strauss' Answer Sheet. Our neediest children really do need high-quality teachers that stick around for much longer than 2 years. These students could make good teachers aids as long as their paired up with effective teachers. Just a thought. There’s more bad news for Teach for America, this time coming out of San Francisco. According to the San Francisco Chronicle, the city’s school board has decided it doesn’t want any more Teach for America recruits — even though there are at least 500 teaching jobs that need to be filled by August. The board was supposed to vote on a contract to accept 15 TFA teachers for the 2016-2017 school year — in science, math, special ed and bilingual education classes — but Superintendent Richard Carranza realized he didn’t have enough support on the panel to get it approved and pulled it from the agenda. TFA, a highly popular organization with school reformers, has won millions in federal funds from the Obama administration and much more from private philanthropy. It is known for giving recruits about five weeks of training in the summer and then sending them into some of America’s neediest schools to run their own classrooms. But as popular as TFA has become with reformers, it has been the target of a growing chorus of critics who say that TFA recruits are not trained nearly long enough to do the work they are asked to do. The criticism, sometimes coming from former TFA members, has risen as the organization has been having trouble meeting recruitment targets. My Post colleague Emma Brown reported recently that applications have fallen by 16 percent this year, down 35 percent from 2013, when there were 57,000 applicants. TFA supporters say that the decline is in part because the job market is improving for college graduates, who constitute the majority of TFA recruits, but it is worth noting that high-performing students the organization seeks are usually not the young people who have a difficult time finding a job. In any case, San Francisco is not the only place that is reconsidering its relationship with TFA. In 2014, for example, the school board in Durham, N.C., voted to end it — even though it had openings for teachers — because, as school board member Mike Lee was quoted as saying: “I have a problem with the two years and gone, using it like community service.” A year earlier, Pittsburgh public schools had decided not to bring in any new TFA members, and Minnesota Gov. Mark Dayton (D) vetoed a line item inserted into the state’s higher education legislation that would have given $1.5 million to Teach for America over two years. We will continue to provide support and training for the cohort of TFA corps members currently in the midst of the first year of their commitments as they enter their second year of teaching, and we will continue to help Teach For America alumni moving to the city or region who are interested in teaching to connect to opportunities in the district. Schools may still hire our qualified candidates, and we’re open to considering alternative financial arrangements with interested schools given the dire shortages; however, we’re already working to meet significant demand from our charter partners within San Francisco and district partners throughout the Bay Area who acted quickly to provide this resource to their schools. Good piece on portfolio-based assessment in Maine. New free, online technologies like Google Tools suite make this actionable. It addresses criticisms folks have of old-school assessment that made use of extensive, tedious binders that are no longer necessary with today's technologies that provide exciting possibilities for millennials today—many of whom come to school already "wired" for this. It's the educators that need to get their skills upgraded, myself included. The 3,000 students in rural Maine’s Regional School Unit 19 begin compiling electronic portfolios of their schoolwork in pre-K, when the district issues every child a Google account. In the elementary years, teachers snap and upload digital photos of handwritten work. In the upper grades, students accustomed to electronically documenting their school lives habitually upload essays and lab reports and record video of their oral presentations. “By the time you hit middle school, the students are just doing it because that’s the way we do business,” says Kern Kelley, the Maine district’s technology integrator. Decades ago, portfolio assessment—using samples of classroom work to document students’ progress toward learning goals—meant finding room for bulging binders stuffed with paper. But digital technologies that make it far easier to collect, curate, share and store student work have dismantled the physical barriers that once made portfolio assessment daunting. Schools are now taking a fresh look at the practice. Artists have always carried work samples in portable cases known as portfolios, and in the 1970s and 1980s, progressive educators began incorporating the idea into assessment programs. In the 1990s, Vermont and Kentucky experimented with statewide portfolio assessment systems, with mixed results. State-level experimentation largely ended in 2002, when the federal No Child Left Behind Act (NCLB) ushered in a demanding annual standardized-testing regime. States abandoned alternative assessments, including portfolios, in favor of multiple-choice tests, says Stuart Kahl, founding principal of assessment company Measured Progress. But the national climate has changed. Common Core and the state-level academic standards based on it stress the higher- order thinking skills and project-based learning that advocates say portfolio assessment promotes. NCLB’s replacement, the Every Student Succeeds Act (ESSA), permits states to incorporate alternative methods, including student portfolios, into their annual assessment programs. ESSA takes effect amid a growing backlash against federally backed Common Core-linked standardized tests. That pushback, advocates say, won’t change portfolio assessment systems, which are often locally developed and designed to respect individual, non-standardized choices. Whether they document the learning process or showcase the final product, portfolios offer richer insights than a set of test answers can, advocates say. “It’s an actual reflection of real work, rather than something that’s contrived and inauthentic,” says Robert Kuhl, principal of High Tech High Media Arts, a San Diego charter school. Choosing which items to include in portfolios requires students to think about their own development in a way that traditional assessments don’t. “The portfolio is really the students showcasing their work, their growth over time—telling their own story of their learning,” says Helen Barrett, a retired education professor at the University of Alaska-Anchorage. And unlike standardized tests, which parents and teachers often see as time- consuming distractions, the work showcased in a portfolio grows directly from classroom instruction. Portfolios are “inherently more fair and more useful” than standardized tests, Kuhl says. “The tests are incredibly discriminatory, and they’re a poor measure of whether or not one should graduate from high school,” he says. With the aid of user-friendly and often low-cost technology, schools are turning to digital portfolios to track assignments, communicate with parents, and help students reflect on their own educational progress. Using free software like the Google Tools suite, or fee-based online systems offered by various companies, students can compile portfolios that include everything from essays on Shakespeare to photos of ceramics projects to videos of a state championship sports game. And digital portfolios stay with students as they move through school and graduate, possibly providing raw material for college applications and resumes. In Maine’s Regional School Unit 19, teachers take photographs of handwritten work using digital cameras equipped with special memory cards that wirelessly upload pictures. The district is experimenting with Wi-Fi equipped pens that can send teachers digital copies as students work through math problems. Each year, students build voluminous electronic archives out of which they curate a smaller set of required assignments, entering links to each item into a spreadsheet that teachers can access at grading time. Students can access the same links later, for a refresher on past material. “Basically, a student is building their own knowledge base of everything they’ve ever done, and it’s a click away,” says Kelley, the technology integrator. At 350-student Howe Elementary School in the Wisconsin Rapids Public Schools in Wisconsin, teachers use the FreshGrade electronic portfolio system to document six writing assignments each year. Teachers can upload photos of young children’s handwritten work, audio of students reading their own compositions aloud, or video of conversations between teachers and students about their writing strengths and weaknesses. In rural Grandview School District in Washington state, Grandview High School’s college and career readiness program requires every student to undergo a pre-graduation “exit interview” with a panel of community volunteers. Students can draw on their digital portfolios—which include work samples, SAT scores and reflections on required job-shadowing assignments—to answer questions about their high school experience and future goals. “As we know as professionals, we have to be able to sell ourselves and be proud of the work that we have put forth,” says principal Kim Casey. Portfolio assessment has its challenges. Teachers need training in how to use digital platforms and how to plan assessments so they can provide students with “actionable feedback,” rather than just a number or percentage from a test, says Creel, now Discovery Education’s curriculum and instruction team leader. 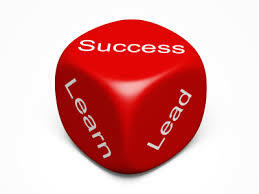 Portfolio assessment remains principally a classroom- or school-based approach. And teachers and educators can expect high hurdles if they try to use it as a broader-based accountability tool. Such hurdles can be practical—Vermont’s 1990s-era portfolio assessment system encountered problems ensuring school-to-school consistency in grading. But the barriers can also be philosophical: Portfolio assessment is designed to record student growth, encourage reflection and honor the idiosyncrasies of personal choice—not to promote standardization and uniformity. Deborah Yaffe is a freelance writer in New Jersey. Students in the pilot districts take the Smarter Balanced exam — a more traditional standardized test that is used in more than a dozen states — in third-grade English, fourth-grade math and eighth-grade English and math. All high-school juniors take the SAT. In the rest of the grades, students must complete performance tasks in math, English and science throughout the year according to where those tasks fall in the curriculum. Some of the tasks are “local,” which help districts measure student progress at certain points in the academic year, but others are “common” which can be compared across districts. Once the tasks are completed, the classroom teachers grade them. “Common” tasks are scored and then validated by the state against predetermined sample answers. For both common and local questions, teachers are trained for about two weeks over the course of the year by their peers to use the scoring guides to grade student answers. Then, for the common questions, teachers compare their scoring processes to those of teachers’ from other schools and districts to ensure they are accurate. Final scores are reported to the state for accountability purposes. For the water tower problem, there were four possible scores a student could receive and three main areas where they needed to show work: models and scale drawings, calculations and mathematical strategy and communication, analysis and recommendation. This idea of "common" and "local" performance tasks addresses concerns some may have about comparability in performance across schools and districts. There is work and investment on the front end, but the payoff is students possessing deep subject knowledge and though not mentioned, improved relationships with adults at school who step out of a "compliance approach," if you will, into one that is relational and educative. Texas is currently considering alternatives to our high-stakes assessment system. New policies (bills) will likely get proposed for the coming 85th legislative session that begins in January, 2017. Will keep everybody posted on this as it unfolds. A good start right now is to read through the governor's commission activities on this that you can locate at this link. Students in an English-learner class at Southport High School work on an assignment during the last period of the day. As Indiana awaits recommendations from a committee that’s trying to figure out what student exams will look like after 2017, one idea out of New Hampshire is capturing the attention of educators. New Hampshire’s “performance tasks” are considered some of the most innovative standardized tests in the country, but they don’t look much like standardized tests at all. The new pilot program in the Granite State — called Performance Assessment of Competency Education or PACE — moves away from the computerized testing and multiple-choice bubble sheets that have been the backbone of annual state exams for decades. In their place, the PACE program asks kids in the eight pilot districts to do “performance tasks” throughout the school year to show deep understanding of the subjects they’re studying. For example, while a traditional geometry exam might ask students to solve math problems and even require them to show how they calculated their answer, New Hampshire now asks them to complete complex problems applied to real-word situations that require a range of skills and knowledge they’ve been learning in class. To complete the task, students must draw models, do calculations, analyze results and write a proposal all in one exercise, Sheedy said. Kathleen Cotton, a curriculum and instruction coach in Sheedy’s district in Rochester, New Hampshire, said that although there is extra work involved on the front end, the performance tasks give teachers information they can use immediately. “You look at some of this high-stakes testing that we have, and it really is not engaging at the time because the students don’t really have any buy-in except of that one score at the end,” Cotton said. Throughout the pilot, Sheedy said his students have been more engaged than they were taking traditional exams. He’s never seen kids so focused as when they are working on the new types of tests. He’s also been impressed by how much by how much developing the tasks has helped him as a teacher. The teacher-led work in designing and learning to grade the tasks was significant. Teams of teachers worked on the questions themselves and the scoring guides to grade them. The New Hampshire experiment is making ripples across the country as more and more states are looking for alternatives to traditional once-a-year testing methods. States looking for new options are encouraged by changes to federal testing regulations that are expected next year when the No Child Left Behind Act is replaced by the Every Student Succeeds Act. The new law still requires every state to create an accountability system that measures annual student performance, but this law allows more flexibility. As many as seven states could be chosen to try new, innovative exams. The work to completely change a testing system isn’t easy, and for larger states with more diverse student populations, varied funding across districts and stricter accountability systems, like Indiana, it’s not clear if this model would see the the same kind of success that it’s seen in New Hampshire. It’s also not clear if Indiana education officials are going to even pursue an innovation pilot under ESSA, although state Superintendent Glenda Ritz and House Education Committee Chairman Bob Behning have expressed interest in New Hampshire’s model. Many Indiana educators say they’re frustrated with years of ISTEP exams that have seen major delays, results that don’t do much to guide instruction and computer testing glitches. Some say they’re ready to try something new, and state officials agree. For now, said Danielle Shockey, Indiana’s deputy state superintendent, the state will focus on its work with the new testing committee before it gets involved in a new federal initiative. “There’s a lot left to be learned about that innovation pilot,” Shockey said. Shaina covers state policy for Chalkbeat, including the Indiana State Board of Education, the state legislature, academic standards, testing, teaching and other issues. This blog is a forum for discussing multicultural research trends as well as the many problems that bias research studies of culturally-diverse groups like Hispanics, African-Americans and Asians. Research issues, studies, books, white papers and other sources of information will be discussed with the goal of improving the quality of multicultural studies and the decisions that follow from such studies. Not just in the Dallas/Fort Worth area, but every place around the country where Latinos are concentrated need to be thinking about cultivating the next generation of leaders. In this vein, Dr. Rincón suggests a kind of literacy that doesn't often come to mind with respect to the general population, including being able through language, culture, and a sense of and knowledge of roots and heritage as key to their development. University Leadership Initiative (ULI) harnesses the talents, abilities and determination of youth -particularly college students- to affect long-term change in a proactive manner. Specially, ULI conducts outreach at the local, state, and national level to address the dilemma faced by young people who were brought to the United States years ago as undocumented immigrant children, but who have since grown up in the United States, have stayed out of trouble, and wish to continue their education on to college. A good number of them have matured in the movement and gone on to other arenas of policies beyond immigration like education, and the social and natural sciences. The leadership is largely comprised of first- and second-generation students and they represent a beacon of hope for our nation. Our third- and later-generation youth also need to get targeted. They may feel greater affinity toward our traditional civil rights organizations like LULAC, TABE, TACHE, or other significant grassroots, local- or state-level organizations, associations, and initiatives. Perhaps folks don't recognize that research itself has a culture is Dr. Rincon's blog points out. This is very good to know and is something addressed across so many of his writings like culturally relevant survey research. It matters how questions get asked and what knowledge base about Latinos this research presupposes and marshals. I very much respect Dr. Rincón's continuing efforts (and now through his blog) to link multicultural research trends to leadership, critical literacies, and community engagement and how to simultaneously optimize these. Much to their credit, Dallas-area academic, business and civic members have embarked upon an ambitious effort to expand the number of Latino leaders that serve this community. Two of these programs reside at Southern Methodist University with similar goals in mind. Part of the rationale for these programs comes from national studies by the Pew Research Center (2013) which showed that two-thirds of Latinos did not know, when asked, who they believed was the most important Hispanic leader in the U.S.; moreover, three-quarters of Latinos believed that a national Hispanic leader was needed to advance the concerns of the U.S. Hispanic community. This national alarm bell, coupled with dismal Latino participation at the local levels, appeared to describe a leadership vacuum in the Latino community that needed some type of intervention. Latinos, of course, are not leaderless. U.S. Latinos have a long history as inventors, scientists, medical experts, military heroes, news columnists, entertainers, and politicians --- they are just not very visible because mainstream media sources choose to overlook their achievements except during cultural holidays. If the story does not involve crime, immigration, under-achievement or poverty, the likelihood of inclusion in mainstream media diminishes even more rapidly. For example, anyone who has lived in the Dallas community for a number of years would have little difficulty in recognizing Latinos that have been on the frontlines of many Latino-related issues. Such names as Adelfa Callejo, Hector Flores, Nina Vaca, Rene Martinez, Domingo Garcia, Marcos Ronquillo, Rafael Anchia, Roberto Alonzo, Tom Lazo, Beatrice Martinez, and Edwin Flores are well-known among Dallas-area Latinos and non-Latinos for their past advocacy efforts related to Latino education, healthcare, immigration, voting rights, business development and other areas. Media reports may label Latinos as “leaders,” “advocates,” or “activists” – depending on the spin desired by media decision makers. Nonetheless, their role in shaping the quality of life for Latinos is undeniable. As the traditional pool of “leaders” or “advocates” diminishes, it is clear that new blood is needed to address the many decisions that will influence the quality of life for Latinos in the future. The need for new blood is especially important in communities like Dallas/Fort Worth that are experiencing rapid population growth and need decision-makers with new ideas to address the challenges brought by this growth. In this light, Latino leadership programs have assumed a great responsibility and deserve as much support as possible. What knowledge will these graduates have of Latinos that reside in the U.S. and local communities? For example, a test of knowledge of Latino culture in the U.S. was recently completed by a non-random sample of 400 Latinos and non-Latinos that represented college students and marketing professionals from the private sector. The test results revealed that both Latinos and non-Latinos had limited knowledge regarding some basic facts about U.S. Latinos. Interestingly, the results also revealed that Latinos did not score much better than non-Latinos on this test. While not a scientific study, the study results suggest that more effort should be devoted towards expanding knowledge about the Latino population – whether at academic institutions or other training vehicles. Moreover, as Latinos continue to assimilate linguistically and culturally, they may also need a refresher course on important elements of the Latino culture. What position will graduates take on issues that especially impact Latinos? The position that a leadership graduate takes on key issues like gun control, abortion, criminal justice, voting rights, racial profiling, the environment, public procurement, and immigration will likely define their appeal in Latino and non-Latino communities. Are graduates being trained to avoid a position on controversial issues or will they be taught how to argue persuasively on behalf of Latino constituents? Are your public speaking skills ready to be tested? General public speaking skills are undoubtedly a valued asset; however, Latino leaders will be expected on occasion to address both English and Spanish-speaking audiences. Since the vast majority of U.S. Latinos do not study Spanish formally, it might be a good idea to encourage our future leaders to brush up on their public speaking skills in both languages. Will graduates be trained to feel comfortable in using the results of research studies? In one presentation to a city council regarding the results of a citizen satisfaction survey, a councilman opined: “If I want to know what people in my community think, I will just talk to them.” Apparently, the councilman did not understand the bias associated with his recommendation in gathering public opinion. Scientific research can provide valuable insights that supplement one’s perspectives and should be part of the training curriculum for these graduates. Will non-Latinos be provided the opportunity to develop their leadership skills if their jobs or political aspirations include Latino communities? It seems like a good investment. There are already enough non-Latinos in leadership positions that lack knowledge and experience with Latino communities. With our increasingly segregated society, the leadership course may provide the right amount of knowledge and perspective needed by non-Latinos who aspire to become advocates for Latino communities. Will graduates understand how to utilize the power of the media which has the potential to define their reputation and standing in the minds of Latino and non-Latino audiences? Markets like Dallas/Fort Worth provide a multitude of communications vehicles to reach diverse audiences, and often conduct public opinion polls to monitor key issues or political campaigns. In such an environment, Latinos who aspire to become visible advocates or “leaders” must understand how to fashion their messages correctly, how the journalism world operates, and the audiences that are served by different communications vehicles. Lastly, will the collective wisdom of past Latino leaders be used as a bridge to the future for the newly trained leaders? It would be a mistake, in my opinion, to believe that “leadership skills” have little or no connection to the past. Past Latino leaders could be helpful in identifying significant people, organizations or historical events that have proved helpful in past Latino initiatives, as well as those that have been less helpful. The new leadership graduates will no doubt have many new ideas of their own, but history should help them avoid repeating the mistakes of the past. 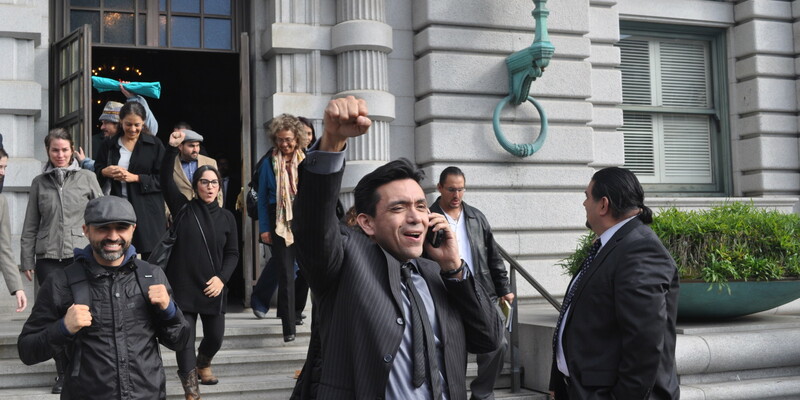 Only time will tell us about the long-term benefits of these Latino leadership initiatives. If they are successful, Latinos will be in a better position to shape their own destiny and become a more visible partner in key decisions that affect their quality of life.